No time to waste! Let's get right to it--another edition of the Grab Bag of miscellaneous highsec miner tears! 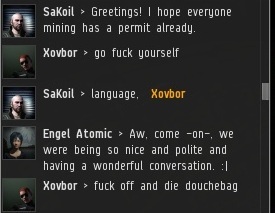 Angry miner Xovbor doesn't know proper mining protocol under our new regime. Profanity is a "no"; promptly presenting your permit upon request is a "yes". I can't stand it when people use language like that. Referring to EVE characters as "toons", I mean. If you're reading this stellar MinerBumping post, it means the rebel assault on our website has failed! Another victory for the New Order! 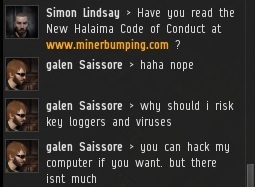 galen Saissore narrowly escapes having his computer hacked by viruses carried by screenshots of crying miners. But at what cost--he can't read the Code! The sheer power of my truth converts many rebels to the cause. Karadell is at precisely the 50% mark in the transformation process. We've gone from being compared to Nazi Germany, all the way to the good ol' US of A. Progress! 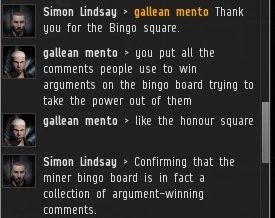 The new Miner Bingo revamp has made the game more popular than ever. Bumpers are thrilled, miners less so. 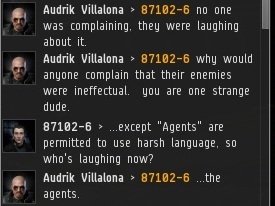 87102-6 was offended by a recent post explaining the Code only prohibits miners from using foul language, not Agents. 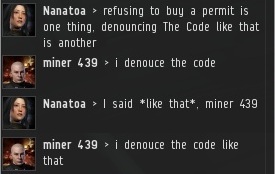 So indignant was he, that he created a thread on EVE-O requesting the CEO of CCP himself issue a statement on whether bumping miners constitutes harassment, given all the loopholes in the Code. Wow! Xovbor caught his breath long enough to spin an insane theory about how maybe I got banned when I logged--because I bumped a miner who was being shot at by rats. If a bumper can keep a miner from warping long enough that the miner's ship is blown up by NPCs, the bumper doesn't get a ban. He gets his own "I was there" video. "Red Penned and Proud" is the slogan of the newest miner civil rights movement? No thanks. 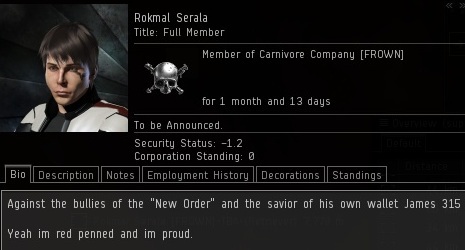 As much as I love and value the rest of my ilk, I do have special qualities that earn me the title of Saviour of Highsec. I possess a unique skillset of bumping miners and blogging about it. Speaking of prophecy and ending on a somewhat apocalyptic note, Odelleger compares me to the Antichrist. As with the Hitler comparisons, the similarities are barely more than surface-deep. And while religious texts are always open to interpretation to some degree, I don't think the end of the world is said to come from the bumping of miners. Arguably "with many heads" could refer to someone who has lots of alts, but my Agents are not my alts. Theory debunked. I'd be very interested to see the miners DDOS Google's servers. Hmm if the weakness for Superman it's kryptonite maybe the weakness for Google it' tadaaaaaaaa VELDSPAR. 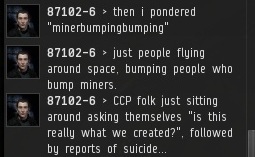 Miners should be happy that they're only getting bumped, they could be getting constantly suicide ganked by the agents of the New Order, something that has long had the explicit approval and support of CCP. I love the conversation with Miner 439, that's hilarious! 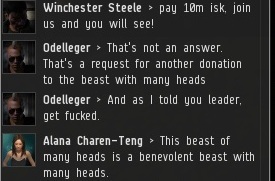 Our officers are currently signing up for eve accounts and are selling millions of USD in plex to fund our enforcement. FBI raid teams are being dispatched with CIA support to track down your IP & address as well. Also all personal assets will be confiscated due to use during the commision of a crime.